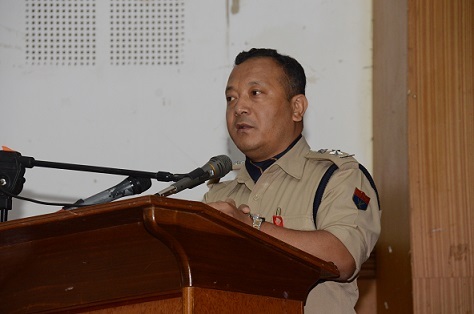 Narco-terrorism is happening in Meghalaya and the problem will further grow if not tackled, a police officer sounded an alarm here on Tuesday, as the State observed the International Day against Drug Abuse and Illicit Trafficking. “Narco-terrorism is happening in the state and we have to tackle it seriously,” East Khasi Hills Superintendent of Police, Davis NR Marak said while address the gathering which was also attended by students at U Soso Tham auditorium here. Marak said that in the past, police have even arrested militants who were linked with drugs trafficking. “Drugs trafficking being a profitable business, is often used to finance anti-national activities,” he observed. He also informed that Shillong, the state capital of Meghalaya, is not only a transit point, but also one of the major distributing centres for heroin to other parts of the country. According to the District police chief, there were people who have been arrested in other states including from airports with heroin, and the heroin was supplied from Shillong. In the last six months, he said that police have been able to seize huge cache of heroin. “One of the problems is that, drug addicts are being made to become peddlers in which they were given to sell drugs in small quantity to sustain their habits,” Marak pointed out while stating that drugs abuse is not only a social and health problem, but is also a crime since possession of drugs is a serious offence. Sharing incidences related to drug abuse, the SP said that many juveniles not only that they started using drugs, but they were also made to be drug traffickers. He urged the youth to say ‘no’ to drugs and sought the cooperation and support of different localities in the city while pointing out that rented houses are also being used for drugs trafficking. According to him, drug traffickers have lots of money and they can easily shift their business from one place to another. The programme was organised by the Meghalaya AIDS Control Society in collaboration with the District Social Welfare Officer, East Khasi Hills, Shillong and other stakeholders. The theme was ‘Listen First – Listening to children and youth is the first step to help them grow healthy and safe’. The Meghalaya Aids Control Society revealed that a total of 2,139 injecting drug users registered with five Oral Substitution Therapy (OST) Centres in the state as on May this year. On the occasion, a youth who recovered from drug addict also shared his experiences of living a difficult life and his journey to recovery. He urged the youth and all citizens not to ever try to experiment drugs and other bad habits as it will really ruin life and one’s career. Dr Arvind Nongpuir, Assistant Professor, Psychiatry Department, NEIGRIHMS talked about the danger of drug abuse and the problem has been accepted as an illness, adding that with proper medical intervention, drug addiction can be treated.